Stand out result from the 2018 British orienteering Championships, held last weekend in Scotland, was David Roome's win in M35L. He is seen here at the finish. Photo by Steve Rush. The score tables after two events may be viewed here. This version also corrects some mistakes in the earlier version. RouteGadget for the University of Cumbria event is available for both races, via the RouteGadget index. Photo above: runners queue for the reverse-order Final start at the University of Cumbria, Lancaster campus. The glorious weather continues to make the organisers' job easier and the runners' pleasure greater! Despite not having the Planner in the country this evening's sprint event went very well and seemed to be enjoyed by all present. Results may be viewed here. Our photo shows overall winner and renowned sprint orienteer Charlotte Ward starting the Final. If you have not had enough orienteering after our summer sprint event at Uni of Cumbria on Tuesday evening, Warrior are putting on a summer evening event at short notice on Wednesday evening in aid of Macmillan cancer support. For details see this link. With just one event in the series so far, and your best three scores to count, there's plenty of time to make a bid for SROC Sprint Series fame! The next event is on 22nd May in the University of Cumbria campus in Lancaster. 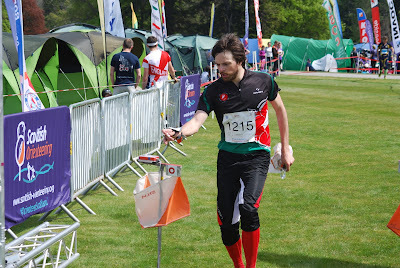 Each sprint event comprises two races, with something suitable for beginners and children as well as the more seasoned orienteer. League scores (pdf). The earlier rain did little to dampen spirits at the first sprint race in the series. Runners had to cope with slippery conditions but were treated to an Iain Embrey speciality, a Micro-O, for the final. This was not as easy as it might at first seem! Results are here, series points will be published later.